Happy Birthday Cooking with Aparna! Hi everyone! Wow, it’s been a long time since I wrote in here. I apologize for the long gap, but things have been crazy! I’m currently working towards applying to grad school and that has been consuming so much of my time. Yea, I know, kinda lame excuse because I still cook, it’s just the writing and picture-taking that I don’t get time to do as much. But I’m back! 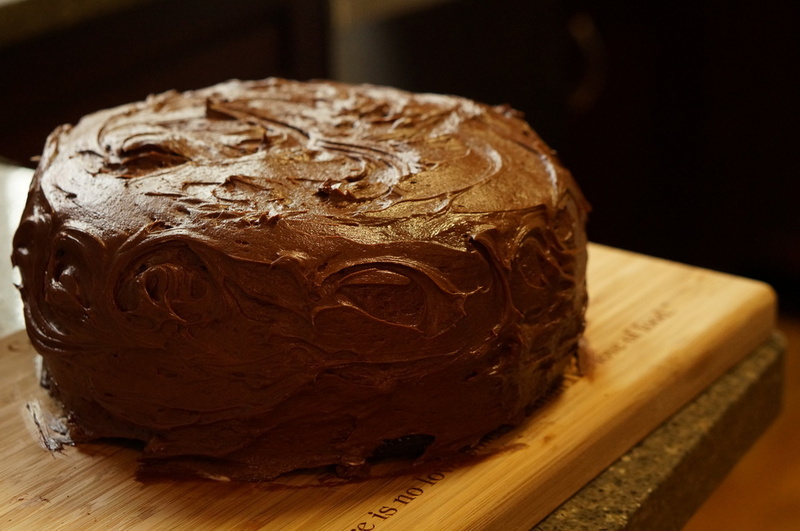 With what I hope will put a smile on your face: chocolate cake. The special occasion? It’s been 1 year since I launched Cooking with Aparna! So of course there has to be some cake to celebrate. This past year, the most popular blog post in terms of page views was when I wrote about my move to San Francisco! You showed me the most love in December, when Cooking with Aparna got the highest amount of traffic ever. One of your most favorite pictures on Facebook was this one of the fried egg sandwich. So, here’s to many more years of eating, cooking, blogging, and together, becoming great cooks! Simply whisk the cream on medium high heat with a handheld mixer for about 4 minutes. Then add the powdered sugar and whisk again for a couple of minutes until the cream has stiff peaks. You’ll have a lot of filling left over so you’ll want to halve this recipe. Tip for icing the cake: if you want the swirls you see on my cake, simply make “8’s” with your spatula on the side and top of the cake.